If you were to walk into a solar store and purchase some of their best-selling PV panels, it is likely that their solar irradiance-to-electricity conversion efficiency would be around 17%. This is the typical efficiency (Fraunhofer ISE Photovoltaics Report, 2017) of the top-selling PV product, a multi-crystalline silicon panel. This means that for a typical panel, 17% of all incident solar energy is converted directly to usable electricity. This is quite impressive for a device that has no moving parts and can generate power at the location where the electricity is required (no transmission losses). It is no wonder that PV is already one of the cheapest power technologies available. However, the question arises: more than 60 years after the first demonstration of a practical solar cell by Bell Labs, have PV researchers already reached the practical efficiency limit for the technology? According to predictions made in a recent publication (2017 International Technology Roadmap for PV), the answer seems to be very much a resounding “No.” Various manufacturing trends that will lead to further major improvements in efficiency over the next decade are already being implemented by industry. In this article, we explore these trends, and summarize with predictions as to how efficient PV panels will be in 10 years’ time. When attempting to predict the efficiency (and cost) of future “factory standard” panels, looking at the current world record for device efficiency can be a good place to start. These records, which are maintained by the PV research community, usually pertain to devices that are specifically fabricated or selected for a world record attempt (certified measurement at an independent test center). In other words, they do not represent the products that are churned out of PV factories under regular operation. However, it goes without saying that as soon as a PV company achieves a world (or internal) record with a particular fabrication method, they will probably be motivated to accordingly modify their standard fabrication to increase the value of their mass-produced products. The current world-record efficiencies for modules (the term “module” is interchangeable with “panel” – the product sold by PV manufacturers) and cells (the constituent building blocks of a module) are shown in Figure 1. We see that the world record efficiencies for mono-crystalline silicon devices are 25.6% and 21.3% — for cells and modules, respectively — and for multi-crystalline silicon, the corresponding values are 23.8% and 19.5%. Interestingly, even though this plot is less than 1 year old, it is already out of date: the record for mono-crystalline solar cells is now 26.6%! The difference observed in Figure 1 between module and cell efficiency is not only true for record devices: modules are – at least for now – typically less efficient than individual cells. This can be due to a number of reasons including i) the fact that modules typically contain so-called dead space – areas that don’t produce power – such as the module frame and space between cells and ii) the fact that electrical losses occur along the connections joining individual cells. Figure 1: The record power conversion efficiency for mono-crystalline and multi-crystalline silicon cells and modules. Image adapted from slide 24 of the Fraunhofer ISE 2016 Photovoltaics Report. So how much higher are these records than the present typical panels mass-produced by PV factories? As mentioned at the start of this article, the typical efficiency of the most commonly installed panels (multi-crystalline silicon) is around 17%. For the high end of the market (premium mono-crystalline), the value is around 21%. In other words, the efficiency of typical panels is lower than the records shown in Figure 1 by a margin of a couple of percentage points. So, without any major further innovation, it can be expected that these typical values will creep up towards the present records. But can we expect further innovations to emerge, which will raise the record efficiencies and drag the typical values along with them? According to the 2017 International Technology Roadmap for Photovoltaics, there are some key developments that will do exactly that. In the following, we’ll look at three of them in detail, and for each innovation, we’ll present the accompanying industry market projections. We will then finish with their overall predictions of the typical panel efficiency we can expect in 10 years’ time! The first innovation we will examine is the transition of the standard cell architecture towards higher efficiency designs. The industry-standard design (known as aluminum back surface field, Al-BSF) currently accounts for 80% of silicon cells manufactured, but its share is predicted to shrink in the next few years. A more sophisticated design, the PERC cell (passivated emitter and rear cell), is expected to become dominant. PERC cells can achieve higher efficiency via the inclusion of a non-continuous dielectric (insulating) layer at the back side. By virtue of its optical properties, this layer improves the reflection at the aluminum electrode, which has the consequence that more light gets reflected back into the cell for a second chance at absorption. An additional benefit is a reduction in electrical losses at the back (Al) side. Shown in Figure 2 are schematics of an Al-BSF cell and a member of the PERC family: a PERL cell (passivated emitter, rear locally-doped). 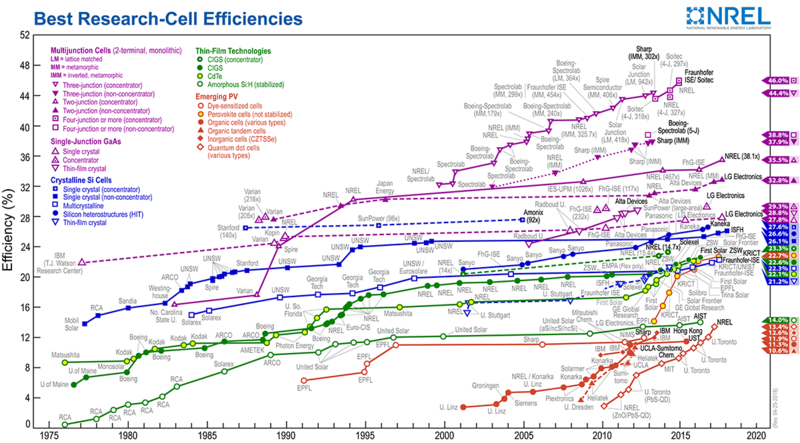 It was the PERL design that enabled researchers to reach the 25% efficiency landmark for silicon solar cells for the first time in 2008. Figure 2: The aluminum back-surface-field (Al-BSF) design, currently the most prevalent silicon cell design in production, and the PERL (passivated emitter, rear locally-doped) cell, which together with the other members of the PERC family, is expected to be dominant by 2027. This image has been adapted from an IMEC article. However, even as the industry embraces the PERC structure, large-scale manufacture of even higher efficiency devices is growing at the same time (predictions for manufacturing trends for the next 10 years are shown in Figure 3). These include the heterojunction (HJ) cell, which uses layers of amorphous (non-crystalline) silicon to reduce electrical losses at the edges of the crystalline silicon wafer, and the inter-digitated back contact cell, which we will introduce shortly. In fact, the world record solar cell, as fabricated by the Kaneka Corporation this year, effectively combined both design concepts to achieve an efficiency of 26.6%. The second innovation we will look at relates to how the current is extracted from within the silicon wafer, where it is generated, to the external circuit. For the most common c-Si solar cell types (including Al-BSF and PERC), current flows axially in the wafer between the top and bottom sides and then laterally along the contacts. The top (sun-facing) contact takes the form of the familiar conducting grids, which aid lateral transport. The grid is comprised of fingers (thin strips of tens of micrometers in width) and busbars (somewhat thicker strips, of the order of millimeters). The fingers can be thought of as arterial roads and the busbars as highways for current. Usually, there are either 3 or 4 busbars, and hundreds of fingers. A schematic indicating the function of the grid, and an accompanying photo of actual cells is shown in Figure 4. Figure 4: Top: A schematic of current flow (white arrows) in a solar cell. Current is primarily collected along the fingers and then fed into the busbars, where it ultimately flows into the external circuit/adjacent cell within the module. Image adapted from PV Education. Bottom: A photo of two cells, with the top contacting grid, consisting of busbars and fingers, indicated. Image adapted from IMEC. So how do PV companies intend to innovate to achieve further improvements in this space? Interestingly, two diverging industrial trends are emerging: increase the number of busbars or remove them from the front surface altogether! Manufacturers following the first approach are doing so because the improved electrical properties of 5 (modern) busbars instead of 3 or 4 can outweigh the increased shading losses. The second approach eliminates the busbars on the top of the cell by introducing an equivalent structure on the back side of the cell. Space for each of the contacts — recall that the other contact is already on the back side — is achieved by endowing both contacts with an inter-digitated pattern — this is where this particular cell design, the inter-digitated back contact (IBC) cell, gets its name. This allows the electrical current to enter and leave the cell on the back side, leaving the front side free of shading! Ten-year projections for the market share expected for these contact structures is shown in Figure 5. There are many more innovations driving the efficiency of solar panels upwards, but we’ll focus on just one more. Whereas the first two trends related to the cells themselves, we’ll now look at one that addresses the losses associated with assembling cells together to form modules. Scientists often use a metric to quantify the losses, known as the cell-to-module power ratio (CTM). Currently, CTM ratios are typically less than 100%, meaning that there is an overall net loss of efficiency when assembling the module. However, this is set to change, such that it will soon be the normal for there to be a net gain! Earlier, we mentioned some factors that act to decrease the CTM (electrical losses along cell connections and module dead space), but at the same time, there are also factors that can increase the CTM. One example is that optimized modules can be an optically favorable environment for the cell. Incident light that reflected from the surface of the cells can be more likely to undergo internal reflections within the module and hence the amount of light absorbed by the cells can be increased. As the industry learns to increasingly exploit effects such as this, and simultaneously reduces losses, such as by transitioning to larger and/or frameless modules with better cell packing (less relative dead space), it is expected that CTMs of greater than 100% will the norm from 2021, as shown in Figure 6. In this article, we have discussed some major trends that are likely to drive up the efficiency for commercial modules. The obvious question at this point is: how will all of these factors combine to determine the efficiency we can expect from PV modules in 2027? The 2017 ITRPV predictions, shown in Figure 7, take into account the trends discussed above, as well as many others, to reach overall predictions specific for each variant of crystalline silicon PV panel. Approximately 20% for the low-end technologies (such as p-type multi-crystalline Al-BSF), up from about 17% today. Approximately 26% for the high-end technologies (such as n-type monocrystalline IBC), up from about 21% today. This means that in 2027, an average premium module will be able to convert more than a quarter of all incident solar energy to electricity. If these predictions prove to be correct, the result will be a very significant increase (roughly 20%, relative) on today’s product. This will be a remarkable example of continued innovation for an industry, which, already more than 60 years old, is already very mature. Ricky Dunbar has worked in solar energy (the vast majority with solar PV, but also with concentrated solar thermal) since 2008. During his career, he has worked in Germany, Austria, Australia and the USA. He has published 11 peer-reviewed scientific papers on solar energy and established an independent solar cell test facility in Australia, one of only a handful of such labs in the world who are relied upon to certify new breakthroughs in PV technology. Aside from renewable energy, his other interests include sustainable living, the outdoors and classic literature.